I’ve just done about twenty-seven seconds’ worth of research, and here is what I’ve got to show for it: About three per cent of people have Attention Deficit Disorder (ADD). Simple math says about 97 per cent of the population does not live with this condition. Well, if you’ve ever wondered what ADD is like, I have the perfect way for you to find out. What you want to do first is travel to Rome with a toddler. Don’t leave home without him. He is essential to the simulation of ADD. Next, you want to go to one of the many museums or churches in Rome which house an artistic masterpiece or two or a hundred. 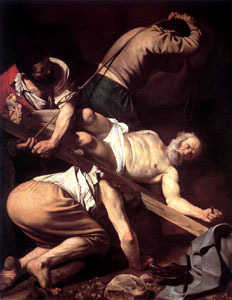 Caravaggio’s The Crucifixion of Saint Peter in Santa Maria del Popolo is an excellent painting for this exercise. Oops, the kid is about to go down the steps from the alcove where the painting is displayed. Better go make sure he doesn’t faceplant on the hard marble floor of the church and crack his head open. Got there just in time. He probably would have gotten down the steps okay, but it’s been a long, hot day and he’s tired. This is when he gets clumsy and accidents are much more likely to happen. You just can’t take a chance. Once you’ve held the little one’s hand as he walks down the steps, and up the steps, and down the steps and up the steps yet another time, tell him he can’t walk down the steps again and pick him up. He’ll let out a loud shrieking wail of protest now, but just wait a few moments until it begins to decrease in volume and then threaten to put him back in the stroller or to give him a time-out – whatever works. He’s heading for those steps again. You say, “Wait!” and get there just in time again. Just like last time, you hold the little one’s hand as he walks down the steps, and up the steps, and down the steps and up the steps yet another time, tell him he can’t walk down the steps again and pick him up. Oh crap. He’s done a number two. Time to grab the stroller, find your partner and leave the church to find a discreet place for a diaper change.